Bengaluru FChave merely been a shadow of their pre international break self, where the Blues were deemed the most complete side in the league. 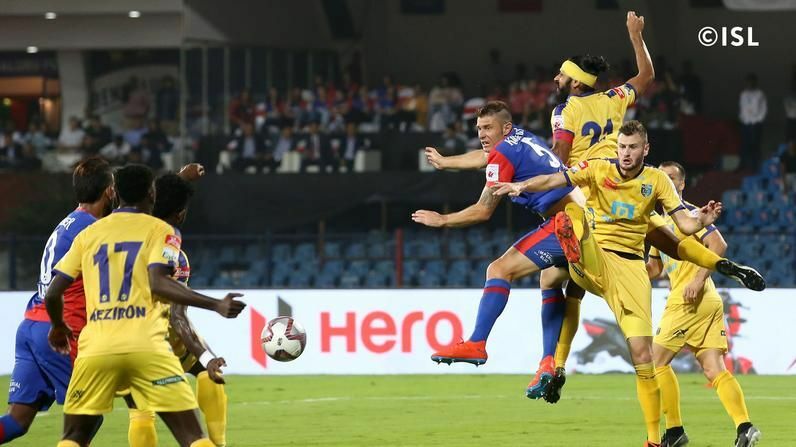 Their style of play, approach to the varying playing styles of the ISL teams, and the never give up attitude have all evaporated in their last three ISL matches against Mumbai City FC, NorthEast United, and Kerala Blasters. Where they were expected to all but seal their qualification in the playoffs with the most number of matches still remaining to be played, Cuadrat has seen his players losing away to Islanders, winning narrowly against the Highlanders, and pulling back a draw against the struggling Blasters. However, while a temporary mellow-down is a common phenomenon for any team in any league around the league, Cuadrat, quite interestingly, chose to play the “physicality” card in press conferences on both the winless occasions. After the 1-0 loss to Mumbai, Cuadrat had even said that “players are not so powerful physically” in a press conference before immediately minimizing the damage by saying that “But they gave everything”. More than anything else, this was bound to have a lasting negative impact in the dressing room, and if not necessarily the results, their performances have surely reflected the down in morale. The concern, more importantly, here is that with ISL still finding its place among Asia’s top leagues, it has always been that physical rigour enabling it to see numerous goals from set-pieces every season. While there have been many experimentations going on, the scrappy and rigid play has largely been the backup plan for most teams. And after ATK and Chennaiyin FC paved the way for the other teams to follow by winning the league twice each with a similar playing style, most teams are seen falling back to the proven formula time and again whenever in doubt. 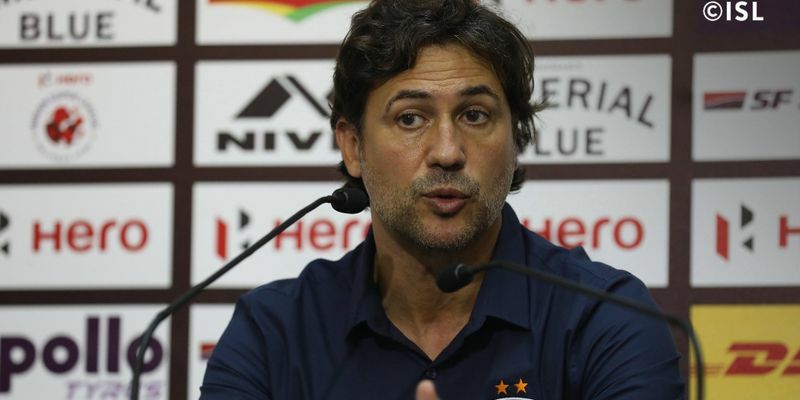 Cuadrat, being the assistant coach to Albert Roca last season, knew what he was getting into even before he took the job and him citing physicality as a reason for bad results is definitely worrisome for Bengaluru fans for it points one of two possibilities – either the Spaniard is out of his depth, or he is not being entirely truthful. And the fans would be begging that it is the second possibility for the first scenario would indicate that the beautiful project i.e. Bengaluru FC needs to undergo massive changes and immediately. The second option is quite probable here too, for Cuadrat cannot come out publicly and criticize fan favouriteSunil Chhetri for failing to execute from the linkup plays in the attacking third. In the absence of Miku, the Indian skipper has looked outwitted often with Bengaluru needing defensive resources to step up and get home the winners. And with the Ecuadorian striker returning next match, the problem would be all but solved. However, if Cuadrat has arrived at a psychological impasse with four matches to go, then the Blues are in trouble. Teams have been seen a more defensive and physical foul-filled approach against Bengaluru off late leaving much at the mercy of ISL’s terrible poor refereeing, and while it wasn’t supposed to affect a quintessentially clinical counter-attacking side, who has largely been best at it regardless of opponents’ playing style, even in the first half of this season, it has surprisingly halted the Blues, and Cuadrat’s team tweak against Kerala proved that it is more of a mental thing. Football would always be counted among the top few recognized sports when one sits down to enlist the top contact sports in the world, but it has also proved time and again that the most supreme of athletes haven’t always ruled the field. For a player to thrive in the long run, of course, good height and weight were viewed as essential attributes thereby making tall players taller and strong players stronger over the years; but it has never guaranteed greatness. Whether it was Pep Guardiola’s Barcelona or Johan Cryuff’s Netherland side of the 1970s, the right technique and the proper players to execute it have mesmerizingly triumphed the size of their opponents time and again. Football has always been widely loved for its mental complexities which are of two kinds – strategic and humane. The first one is a fairly easier and well-documented barrier to break where elements like formations, possession, movements come into consideration with the coach’s function mainly being in outsmarting his counterpart with X’s and O’s. This is the easier part if football was only strategies needed to be executed to perfection, for it would then be limited to androids with no emotions involved. It is the other part, the humane one, which makes football magical. This part constitutes one’s individual and the team’s collective mental strength, one’s emotional control under pressure situations, one’s adaptability and creativity in telling conditions, one’s ability to get the job done under high expectations or no expectations at all. This mental aspect requires a player to fend off-the-field distractions, to perform even when one is hated by fans or teammates, to succeed after failing on the previous three times. Fortunately, this less acknowledged mental aspect of football is already present in Bengaluru FC players, as evident from some of their gritty displays on the road that includes the likes against ATK and FC Goa. However, unless Cuadrat regains it for himself, the Blues are looking at yet another fruitless season. Cuadrat’s inability to think beyond opponents’ superior physicality and self-restriction to put his players to the grill might even stem from his premature career end that couldn’t survive the vicissitudes of the sport. It was an injury that had ended his playing days at the age of 30 and then again it was another knee injury that had ended his stint as an assistant coach at BFC under Albert Roca last season. Despite Bengaluru having a tailor-made squad that could counter-attack with utmost perfection, Cuadrat could always choose to be proactive rather than reactive. And the Sabadell-born Cuadrat wouldn’t need to look farther for inspiration in this case. 18 kms from his native place, Barcelona had once come extremely close to perfecting football with two little magicians – Andres Iniesta and Xavi Hernandez – in the midfield. Bengaluru, too, have nimble footed Dimas Delgado and Xisco, who could bring technical superiority in the midfield with Erik Paartalu providing muscle up top to topple sturdy defences, while Chhetri, for his weaker link play, can always compensate with his masterful finishing up top. However, all these tactical changes wouldn’t work until Cuadrat believes that his team has everything in them to overcome physically dominant opponents.